Like Romeo and Juliet, Julius Caesar is a Shakespeare play we know a little too well, or at least think we do, and that familiarity can sometimes stop us from getting past the surface. One thing we think we know: Caesar is a go-to in politically tumultuous moments. It attracts “now more than ever” marketing language like a magnet draws iron filings. It made a ham-fisted, pointlessly controversial splash at the Public in 2017 when Caesar paraded around in a bad suit and a Trump wig, and that same year, director Shana Cooper first staged her version of the play at Oregon Shakespeare Festival. Now Cooper’s take has arrived in a slightly re-envisioned form at Theatre for a New Audience, and though it’s mercifully Trump-free, it still feels under-baked. The stage is full of visual ideas, the kind you can tell meant something specific to the people brainstorming but that haven’t made the jump past the footlights, and so, for all the energetic efforts of its actors, the production never gathers its power. Cooper’s Rome is a janky collection of broken white drywall and plastic sheeting. The Roman Republic, Sibyl Wickersheimer’s set tells us, is in a fragile state, though there’s something a bit too purposeful in the decay: The space feels more contrived than organic, especially when a pre-set chunk of wall pops out of place and clatters to the ground during a moment of over-safe chaos. The senators and soldiers who people this Rome are, in Raquel Barreto’s costumes, a basically modern lot. They could work in coffee shops in Brooklyn or offices in midtown depending on their status, though they sometimes put on creepy papier-mâché masks and ratty wigs (perhaps nodding to their ancient Greek cousins) when they want to become anonymous mobs of citizens. Sometimes they carry around plastic five-gallon construction buckets, investing them with great significance. Sometimes, their acts of violence are staged literally, as when the “noble Brutus” (Brandon J. Dirden) and his co-conspirators stab Caesar (Rocco Sisto) on the senate floor. Other times, Cooper attempts something symbolic: When the Romans, stirred up by Mark Antony (Jordan Barbour) after Caesar’s death, tear apart the poet Cinna (Galen Molk), wrongfully identifying him as one of the conspirators, Molk is never actually touched by his masked assailants. Instead, he writhes on in a puddle of blood on a plastic sheet, while the crowd stomps on the floor around him. This is the kind of well-intentioned aesthetic mishmash that ironically emerges not from too little thought but from a great deal of it that got caught up in itself. Cooper’s actors commit fully, whether to streaking themselves in mud before battle or to a series of half-martial, half-dance-y transitions (the choreography is by Erika Chong Shuch), but they can’t prevent a feeling of diffusion from creeping through the proceedings. Try as they might, they can’t prevent that deadening sense of safety that so often afflicts stagings of Shakespeare’s war plays, either. Much is effortful here, but nothing is scary. Nothing jerks us forward to the edge of our seats — least of all the murder of Cinna, which is so dutifully, meticulously prepared for by the actors (lay out the plastic, pour out the blood, wait for Molk to strip down to his boxers) that it reads less as a massacre than as a group effort not to make a mess. What keeps us engaged are a few individual actors punching through the hodgepodge and grabbing the text by the throat. Stephen Michael Spencer is an excellent Caska, the conspirator whose jokey affect disguises the viciousness of a hungry dog. Surly and grounded, with hard, staring eyes and a bullying humor that makes him feel like a dangerous Jack Black, Spencer is out there doing the Lord’s work — he’s listening with his whole body and breezily, assertively making the text his own. Beside him is Barret O’Brien as a creeping, pensive Decius Brutus, the conspirator whose well-placed flattery convinces Caesar to defy bad omens and show up at the Capitol on the fateful day. In one of the production’s strongest moments, Mark Bedard also makes a poignant impression as the conspirator Trebonius: In the moments after Caesar’s murder, Cooper smartly undermines the bloody gang, allowing a feeling of awful hesitancy to ripple through the room. Though they rally themselves back into a united front, exiting with a chant of “Liberty! Freedom! Tyranny is dead!,” the palpable thought hanging in the air is more clearly something along the lines of “We’ve made a huge mistake,” and with no one is this ugly sense of vertigo more pronounced than Bedard. It’s a pity then that the main players leave us relatively cold. Matthew Amendt is putting plenty of force into the “lean and hungry” Cassius, but for long stretches of the text he gets caught up in playing a tone rather than driving into the specific meaning of each line. Sisto’s Caesar is stately and avuncular but doesn’t give us much sense of what Cooper makes of the role, and though Jordan Barbour’s Mark Antony is sufficiently smooth-tongued, he is, by definition, not there to wrench our hearts: Like Henry V, he’s a ruthless tactician disguised as a hail-fellow-well-met populist (beware the Shakespearean orator who claims to be a “plain blunt man”). He’s got to have a heart-wrenching Brutus as his foil, and here, Cooper and Dirden fall into a standard Brutus trap — they make the play’s real center all reason with hardly any internal turmoil. It’s the danger of taking the character’s avowed philosophy of Stoicism too much at its word. Brutus is a study for both Hamlet and Macbeth: He’s as intelligent, as in touch with his conscience, and as tortured as either of them, before the deed and after it. “Between the acting of a dreadful thing / And the first motion, all the interim is / Like a phantasma, or a hideous dream,” Brutus reflects on the eve of the murder. “ … And the state of man, / Like to a little kingdom, suffers then / The nature of an insurrection.” Brutus is at war with himself — the Tragedy in the play’s full title is far more his than Caesar’s — and yet Dirden remains largely a creature of intellect. In that, his Brutus becomes a kind of stand-in for the production itself: Clearly full of thought and good-faith effort, yet somehow disconnected, fighting a fight that never reaches our guts. 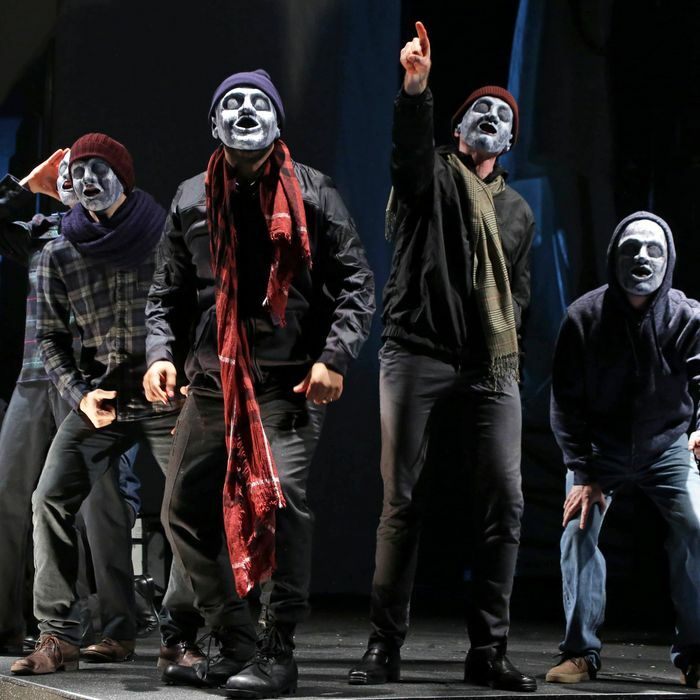 Julius Caesar is at Theatre for a New Audience through April 28.